> Buying Guides > Do 21:9 Ultrawide Monitors Fit in the Office? Most Shopped Tech Products of Q1 2015SSD Prices Fall to $0.33 per Gigabyte—How Low Will They Go? Do 21:9 Ultrawide Monitors Fit in the Office? As ultrawide monitors catch on with consumers, particularly tech enthusiasts and gamers, the office might be the best fit for a 21:9 screen. The aspect ratio provides a great alternative to a multi-monitor setup, and offers more useable screen real estate than a single 16:9 widescreen. With the additional horizontal space on an ultrawide monitor, you can lay up to four windows side by side. This provides about the same benefits as using multi-monitor setups over a single monitor, as we have argued previously. With an ultrawide monitor you get even more—in fact, a single 21:9 ultrawide monitor can have as much horizontal space as two 16:9 monitors—while taking up less physical space on a desk. Check out how LG offers a Screen Split application which creates multiple virtual monitors out of a single 21:9 display—see below. In many work environments, screen size is just as—or even more—important to productivity than resolution. The shift towards 4K content and displays shows that consumers want higher resolutions as much as larger screens. Resolution and size work together in terms of productivity-wise; a denser resolution allows you to fit more information and detail onto a display, which translates into more windows and programs being viewable on one screen. When it comes to 21:9 monitors, two resolutions dominate: 3440 × 1440 and 2560 × 1080. The larger 1440 resolution has 4,953,600 pixels while the smaller 1080 resolution has 2,764,800 pixels. The two largest 16:9 resolutions are 2560 × 1440 and 4K (3840 × 2160). A 4K monitor has more pixels, but on any screen smaller than 36 inches, text can be illegible due to pixel density. 21:9 monitors, especially 3440 × 1440 models, offer the right amount of pixels with screen sizes above 30 inches diagonal. Unless you have dual 1440p monitors, an ultrawide screen still offers more screen real estate. A dual 1080p monitor setup only offers a total of 4147200 pixels, still less than a 3440 × 1440 ultrawide monitor. With an ultrawide monitor, you also don’t have to deal with annoying screen bezels in your field of view, which can drive some people mad when using multiple monitors. In fact, users go as far as DIYing solutions to removing bezels. This will result in void warranties and a higher chance of damage as the edges of LCD screens are very fragile. Selling Points: One of the most popular 21:9 ultrawide monitors on the market, it features an IPS (In-plane switching) panel and has excellent horizontal viewing angles. It features a bevy of rear connections, include two pass-through Thunderbolt ports. Reviews: Users are saying one of these can be nearly as effective as a dual 1440p setup and supports multitasking excellently. The downsides of this monitor include a fairly common light bleed problem and a terrible stand. Thankfully, the latter can be fixed with a simple VESA mount. 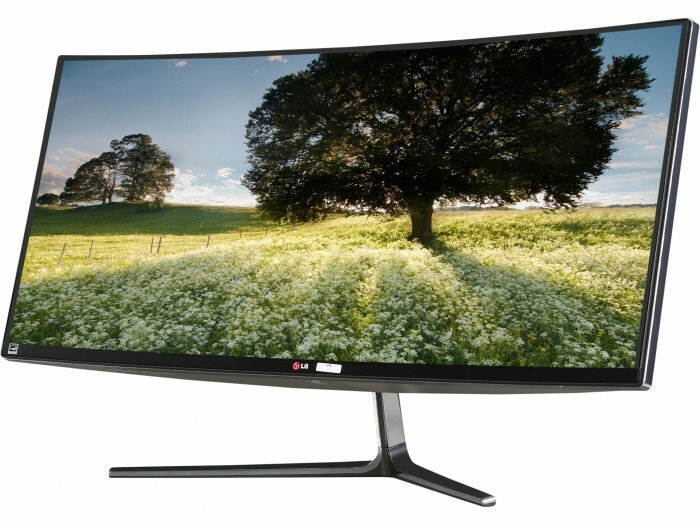 Selling Points: A curved screen mated to a 21:9 aspect ratio makes for an interesting combination. As its name implies, the S34E790C is geared towards entertainment and immersion. It sports a VA (Vertical alignment) panel, which offers better viewing angles and darker black levels. Reviews: The high price makes this monitor more exclusive, but the reviews paint a good picture. Reviewers say the curved screen and aspect ratio work well together and backlight bleed is minimal. However, Mac users may want to pass on this one as it offers no Thunderbolt connection—just HDMI and DisplayPort. If you’ve used or have a 3440 × 1440 screen, how have you liked it? Let us know what you think of ultrawide monitors in the comments. Why stick with dual monitors? 21:9 ultrawide monitors mate bigger screens and higher resolutions to offer more useable screen real estate. 2. I have the LG Ultrawide you mention. It is a great monitor in many respects, BUT in daily operation it gives up too much real estate vertically and so reduces the benefits it could have provided.